Report on the 3rd annual West of West Wine Festival Grand Tasting, on Sunday August 4th, 2013, at The Barlow in Sebastopol, California. The emphasis of the event is on wines from the western part of the Sonoma Coast AVA. This year’s West of West Wine Festival ran from Friday August 2nd through Sunday August 4th. Beginning with several winemaker Welcome Dinners on Friday evening, the event continued with two Saturday seminars – the first one focusing on the recently-formed Fort Ross-Seaview AVA, and the other featuring a blind tasting of Syrah from the West Sonoma Coast and other regions around the world. The first of two Grand Tastings was on Saturday afternoon, followed by a Grand Dinner that evening prepared by James Beard Award finalist Steven Satterfield of Miller Union Restaurant in Atlanta. New to the event this year were three Sunday morning vineyard tours (of Freeman, Halleck, and Doc’s Ranch), and the Festival concluded with a second Grand Tasting on Sunday afternoon. I attended the Sunday afternoon Grand Tasting, and all of the tasting notes below are from that portion of the event. The West of West Wine Festival is hosted by the West Sonoma Coast Vintners (WSCV) – an organization of both wineries and growers that was formed just a few years ago. Among the goals of the group is to “preserve and protect the history, landscape and culture of the West Sonoma Coast,” and to “promote the wines, vineyards, and culture of the region to the media, trade and public.” The WSCV also seeks to “increase collaboration and cooperation among producers and growers in the region.” Founding members of the WSCV included Failla, Freeman, Freestone (Joseph Phelps), Peay, and Red Car, and Red Car’s Carroll Kemp was the organization’s first president. Ken Freeman is the current president. This was my second year attending the West of West Wine Festival Grand Tasting. The WSCV currently includes over 40 member wineries, and nearly all of them poured their wines at the Grand Tasting on Sunday. It’s important to note that not all of the wineries themselves are located within the western Sonoma Coast area – many of the organization’s winery members are located in other areas but source fruit from the western Sonoma Coast. 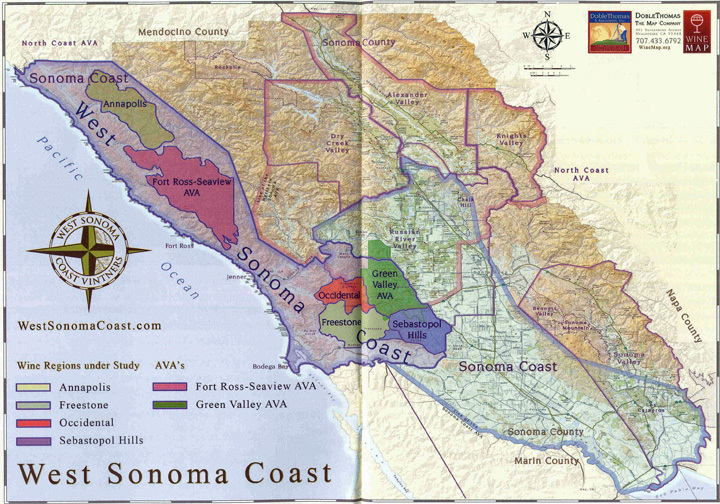 Green Valley and Fort Ross-Seaview have already gained AVA status within the larger Sonoma Coast AVA, with Fort Ross-Seaview being approved in 2011. The other regions mentioned above – Annapolis, Occidental, Freestone, and the Sebastopol Hills – are under study as potential AVAs, though none of them have been formally proposed as such at this point. And even if all of those regions were approved, it would still leave a very large portion of the AVA undifferentiated. Are wine consumers savvy enough to understand that these growing regions are part of the Sonoma Coast? Or will it just cause undue confusion among most consumers? These are issues that proponents of creating further AVAs within the broader Sonoma Coast appellation are certainly trying to deal with as they move forward. The tasting presented an excellent opportunity to taste wines from some highly-acclaimed producers, several of which don’t often pour at public tastings. The event moved this year from Occidental to the new Barlow complex in central Sebastopol. Everyone I spoke with about the location change had a very positive response to the new venue. 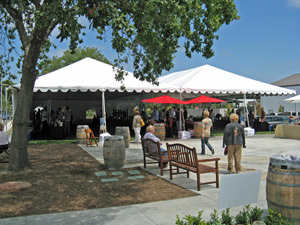 As was the case last year, the Grand Tasting was held under a large tent. Sebastopol can get hot during the summer, but the weather during the Festival was quite mild, and this led to a great tasting experience on Sunday afternoon. I heard from several people that the Saturday tasting was more crowded, but I thought the attendance at the Sunday tasting was up from last year’s, a good sign for the event. Winery tables were spread out nicely, and they were arranged alphabetically with good signage, making it easy to circulate throughout the tent and to find specific producers. As I’d found last year’s tasting, many winemakers were behind the tables pouring their wines – though I got the sense that there were not quite as many doing that at the Sunday tasting as there were last year. Overall, the tasting was well-organized and ran smoothly from beginning to end, thanks to the organizers and many volunteers on hand. And in keeping with the West Sonoma vibe, I found it to be a relaxed, low-key affair. The producers pouring at this year’s Grand Tasting were mostly the same ones who participated last year, along with a few new faces. Although I tasted wines from 25 producers, there were several others I’d hoped to visit but ran out of time. As I often do, I skipped a few whose wines I’d tasted at other recent events (MacPhail, Small Vines, Soliste) though I did revisit some others that were pouring wines I had not tasted before. Being a decidedly cool-climate region, grape varieties grown in the West Sonoma Coast are largely Chardonnay and Pinot Noir, while Syrah plays a significant though smaller role. Other varieties comprise a much smaller percentage of the grapes grown in the region. Sure enough, besides a handful of Syrahs, nearly all of the wines being poured at the West of West Grand Tasting were either Chardonnay or Pinot Noir. Vineyard sources for the wines poured at the tasting were from all over the Sonoma Coast AVA. Unlike last year, when I found a handful of wines that were made entirely or largely from Petaluma Gap fruit, nearly all of the wines I tasted were sourced from vineyards in the West Sonoma Coast area. I did come across a couple of non-Sonoma Coast wines but tasted only one (which was quite good). As was the case at last year’s tasting, many producers showcased their own estate vineyards, while it was also possible to compare wines sourced from the same vineyard but made by different vintners – for example, I tasted Hirsch Vineyard Pinots from five producers. 32 Winds 2011 Chardonnay, Lucky Well Vineyard, Sonoma Coast. From Wente clone Chardonnay. Very light color, with stone fruit, earth, and spice aromas. Medium-light bodied, with a fairly bright texture and lively finish. 32 Winds 2010 Pinot Noir, “Maestro,” Sonoma Coast. From the organically-farmed Sonoma Stage Vineyard, with Calera and Swan selections of Pinot, aged in about 35% new French oak. Medium-light ruby color, this displayed tart cherry fruit along with mushroomy, earthy notes. Medium-bodied, with refined tannins. 32 Winds 2010 Pinot Noir, Hirsch Vineyard, Sonoma Coast. From a mix of Pinot clones, aged in about 40% new French oak. Medium-light color, featuring strawberry and cherry fruit, tea leaf, orangepeel, and earth, plus undertones of spice and oak. Bigger and more structured than the “Maestro” bottling, this had moderate tannins and a lingering finish – nice now and should age very well. 32 Winds 2011 Pinot Noir, Lucky Well Vineyard, Sonoma Coast. From mostly Swan clone with some Pommard. Medium-light color, with red fruits, stony minerals, herbs, and baking spice on the nose. Very bright acidity in the mouth and a lively finish with medium tannins – has potential but showing very young and needs time to develop. Comments: 32 Winds is a fairly new venture, with the first release from the 2006 vintage. The wines are made by Ehren Jordan of Failla. Lucky Well Vineyard, a few miles north of Occidental, was planted in 2007 by noted grower Ulises Valdez, and the 2011 vintage was 32 Winds’ first working with this vineyard. Baker Lane 2012 Rosé, Sonoma Coast. From fruit farmed for Rosé and whole-cluster pressed, about 90% Syrah and 10% Pinot Noir. Very light salmon/pink color, with cranberry, strawberry, and touches of citrus and herbs on the nose. Bright mouthfeel with zingy acidity and a bit of tannic bite on the crisp finish, nice. Baker Lane 2009 Pinot Noir, Ramondo Vineyard, Sonoma Coast. Medium-light color, this had savory/herbal aromas along with cherry, earth, and spice. Medium-bodied with lively acidity and fine tannins. Baker Lane 2009 Syrah, Estate, Sonoma Coast. Co-fermented with about 3% estate Viognier andaged in puncheons, about 20% new. Medium-dark color, featuring earth, black olive, herbs, and dark berry fruit. Medium-bodied, a stony mineral note came out on the palate, with bright acidity and a moderately grippy finish, nice. Comments: Fruit for the Baker Lane wines comes mostly from their estate vineyard near Sebastopol and from nearby Ramondo Vineyard, which they lease and farm. The first Baker Lane wines came from the 2004 vintage, and the label focuses on Pinot Noir, Syrah, Rosé, and a new estate Viognier. Owner/winemaker Stephen Singer and vineyard manager Greg Adams were behind the table pouring the wines. Banshee 2012 Chardonnay, Sonoma Coast. Sourced from five vineyards, made in both stainless steel and in new and older oak, with partial malolactic fermentation. Very light color, this was very fruit-forward, with ripe stone fruit and tropical fruit aromas along with some spice and hints of vanilla/oak. Lighter-bodied with a fairly lively mouthfeel and a smooth finish. Banshee 2011 Pinot Noir, Hurst Vineyard, Sonoma Coast. From a vineyard in the Sebastopol Hills, with 115, 667, and 777 clones. Medium-light color, with higher-toned red fruits, fresh herbs, and baking spice. Medium-light bodied with a bright mouthfeel and milder tannins on the finish. Banshee 2011 Pinot Noir, Tina Marie Vineyard, Sonoma Coast. From 667 clone aged in older barrels. Medium-light ruby color, displaying savory and herbal aromas plus raspberry and plum, earth, and spice. Medium weight on the palate with more structure and grip than the Hurst Vineyard bottling – could use more time to develop. Comments: Founded by Baron Ziegler, Noah Dorrance, and Steve Graf, Banshee is a négociant winery – purchasing wine in barrel from other producers and crafting their own wines from it. 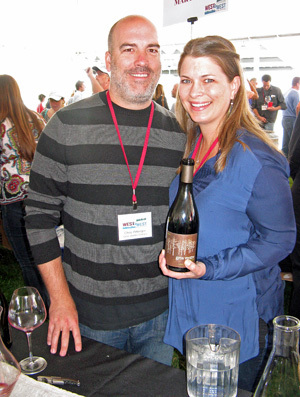 Ross Cobb (of Cobb and Hirsch) and Katy Wilson (of LaRue) joined the Banshee winemaking team in 2012. The Tina Marie Vineyard Pinot was my favorite of the three wines I tasted. Benovia 2012 Chardonnay, Three Sisters Vineyard, Fort Ross-Seaview (barrel sample). Light yellow color, with citrus, spice, and vanilla/oak aromas. Medium-bodied with zingy acidity and a crisp, clean finish. Benovia 2012 Pinot Noir, Tilton Hill Vineyard, Sonoma Coast (barrel sample). From Calera, 943, and Swan clones. Medium ruby color, this featured ripe black cherry and raspberry fruit, spice, earth, and undertones of sweet oak. Medium weight in the mouth with lively acidity and a long, tangy finish. Comments: Joe Anderson and his wife Mary Dewane teamed up with winemaker Mike Sullivan to establish Benovia in 2005. Their new estate Tilton Hill vineyard is located near Freestone. Marcassin has produced acclaimed wines from Three Sisters Vineyard in the past. Mike poured two barrel samples that are clearly still developing but show a lot of promise. Ceritas 2011 Chardonnay, Porter-Bass Vineyard, Sonoma Coast. From 30-year old vines, made in older oak. Light straw color, with bright lemon, herb, and lees aromas plus hints of wet stone. Medium-light bodied with a vibrant mouthfeel and clean, refreshing finish, nice. Ceritas 2011 Pinot Noir, “Costalina,” Sonoma Coast.Sourced from two vineyards near Occidental, including Escarpa.Lighter color, showing bright and forward strawberry and cherry, herbs, and a forest floor note on the nose. Medium-light weight with a lively texture and fairly mild tannins on the finish. Ceritas 2012 Pinot Noir, Elliott Vineyard, Sonoma Coast (tank sample).Light ruby color, with more focused bright red fruit along with earth, herbs, and hints of flowers and tea leaf. Medium-light bodied, this had good structure with fine tannins on the long finish, nice. Ceritas 2012 Pinot Noir, Hellenthal Vineyard, Sonoma Coast (tank sample).Medium-light color, this displayed more intense black cherry aromas and a more savory character, with mushrooms, herbs, and stony mineral notes. Bigger and more structured than the previous wine, with a grippier tannic finish, should be very good with some time in the cellar. Comments: John Raytek and his wife Phoebe Bass founded Ceritas in 2005, and the focus has been mainly on Sonoma Coast Chardonnay and Pinot Noir. Phoebe’s family owns Porter-Bass Vineyard, located near Forestville. John and Phoebe were both on hand to pour their wines at the tasting. The two 2012 Pinots were to be bottled the week after the tasting and released in spring 2014 – both of these were very good, as were the other two wines. Cobb 2008 Pinot Noir, Emmaline Ann Vineyard, Sonoma Coast. About 35% new oak. Medium-light color, this displayed a very stony/mineral character, along with dried herbs, earth, and red fruits, and a slight floral note. Lively texture on the palate, with moderate tannins, nice. Cobb 2009 Pinot Noir, Joy Road Vineyard, Sonoma Coast. Slightly darker ruby color, this was more fruit-forward, with plum and raspberry, plus spice and a touch of forest floor. Bright acidity with a long finish. Cobb 2010 Pinot Noir, Diane Cobb – Coastlands Vineyard, Sonoma Coast. Not yet released, sourced from a 1.5-acre block of Coastlands. Medium-light color, featuring savory and herbal aromas, along with black cherry, smoke, spice, and earth. Medium-light weight on the palate with vibrant acidity and fine tannins on the lingering finish, very nice. Comments: Ross Cobb (who also makes the wines for Hirsch Vineyards) was behind the table. Emmaline Ann Vineyard is west of Sebastopol, while Joy Road and Coastlands (Cobb’s estate vineyard) are farther west near Occidental. Ross’ parents David and Diane first planted Coastlands Vineyard in 1989, and David and Ross established the Cobb label in 2001. Failla 2012 Pinot Noir, Sonoma Coast. Bottled in May, made from younger vines sourced from five vineyards, aged in 5% new oak. Lighter color, this had forward red fruits, spice, and a floral note. Fairly light-bodied with a lively texture and finish. Failla 2011 Pinot Noir, Occidental Ridge Vineyard, Sonoma Coast. About 25% whole-cluster fermentation. Medium-light color, with a savory character plus bright cherry and plum, spice, and earth. Medium-bodied with juicy acidity and more structure than the previous wine, with moderate tannins on the lingering finish, nice. Failla 2011 Pinot Noir, Hirsch Vineyard, Sonoma Coast. Medium-light ruby color, showing herbal and earthy aromas up front, followed by raspberry and plum, and hints of spice and oak. A bit bolder on the palate than the previous wine, with bright acidity and fine tannins, nice. Comments: Originally called Failla Jordan, the winery was founded in 1998 by winemaker Ehren Jordan and his wife Anne-Marie Failla. Their first Pinot was a Keefer Ranch bottling from the 1999 vintage, and Pinot has been at the core of the wine production over the years. Failla has an estate vineyard located in the Fort Ross-Seaview AVA. Flowers 2011 Chardonnay, Sonoma Coast. Sourced from several vineyards, with about 35% estate fruit, fermented in 18% new oak. Very light color, this displayed bright pear and stone fruit aromas along with notes of citrus, fresh herbs, and a touch of toasty oak. Medium-bodied with a lively texture, this had a long, clean finish, nice. Flowers 2011 Pinot Noir, Sonoma Coast. About 5% whole-cluster fermentation, aged in 23% new oak. Medium-light color, with black cherry, spice, earth, and tea leaf on the nose. Medium-light weight on the palate, with a stony mineral note and refined tannins on the finish. Comments: Walt and Joan Flowers began planting Chardonnay and Pinot Noir at their remote Camp Meeting Ridge Vineyard northwest of Cazadero (in what’s now the Fort Ross-Seaview AVA) in 1991, and two more estate vineyards were planted nearby about 8-10 years later. 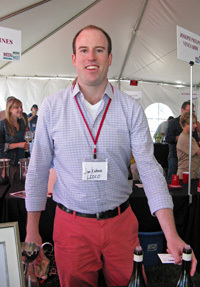 Jason Jardine took over as the winemaker in 2010. Ed Thralls poured the Flowers wines at the tasting on Sunday. Freeman 2011 Pinot Noir Rosé, Sonoma Coast. Light salmon color, this had savory herbal aromas along with red fruits and hints of flowers. Medium-light bodied, with a bright mouthfeel and finish, nice. Freeman 2011 Pinot Noir, Sonoma Coast. Sourced from six vineyards and aged in 32% new oak. Medium-light ruby color, featuring bright strawberry and red cherry, earth, and baking spice on the nose. Medium-light weight on the palate with fairly mild tannins. Freeman 2011 Pinot Noir, “Akiko’s Cuvée,” Sonoma Coast. A barrel selection, sourced from nine vineyards in 2011 and aged in 47% new oak. Medium-light color, this showed more earth, herb, and stony mineral notes than the previous wine along with raspberry and cherry fruit and a touch of sweet oak. More structured mouthfeel with lively acidity and refined tannins, nice. Comments: Established in 2001 by Ken and Akiko Freeman, the winery features a striking wine cave tunneled into the hills west of Sebastopol. Making exclusively Chardonnay and Pinot Noir, Akiko heads up the winemaking team, which includes consulting winemaker Ed Kurtzman. Freeman farms a 7-acre estate vineyard near the winery and a newer 14-acre vineyard located just three miles from the ocean. 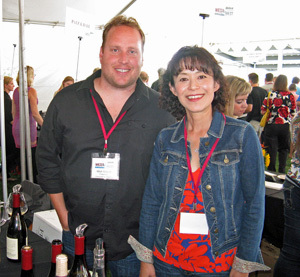 Akiko Freeman poured her wines at the event along with assistant winemaker Mitchell Masotti. Gros Ventre 2011 Pinot Noir, Sonoma Coast. Sourced from three vineyards, using eight Pinot clones, aged in 44% new oak. Medium-light color, with bright cherry and raspberry, spice, and orangepeel aromas. Medium weight on the palate, this had a lively mouthfeel and fairly smooth finish. Gros Ventre 2011 Pinot Noir, Campbell Ranch, Sonoma Coast. From a vineyard in the Annapolis area. Medium ruby color, this was less fruit-forward, featuring savory and stony/mineral notes along with forest floor and spice, plus raspberry and plum fruit. Bigger and more structured in the mouth than the previous wine, with more noticeable but fine tannins and a long finish, nice. Gros Ventre 2011 Pinot Noir, “First Born,” Sonoma Coast. Barrel-aged for an additional six months, and bottled in April, to be released this fall. Slightly darker color, showing riper and darker fruit, earth, spice, and some sweet oak on the nose. Richer mouthfeel with a bit more tannic grip on the finish, could use more time in the bottle to develop. 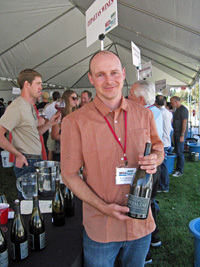 Comments: Gros Ventre was launched in 2009 by Chris and Sarah Pittenger, and they both poured their wines at the event. Chris is also the winemaker for Skinner Vineyards in El Dorado County, where the wines are made. 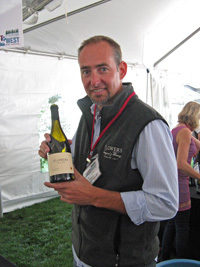 Gros Ventre specializes in Pinot Noir from the Sonoma Coast, Russian River Valley, and Anderson Valley. Halleck 2012 Dry Gewürztraminer, Russian River Valley. Very light straw color, with intense lychee and spice aromas. Medium-light weight on the palate with a fairly smooth texture and lingering finish, nice. Halleck 2008 Pinot Noir, “Hillside Cuvée,” Sonoma Coast. Medium-light garnet color, showing earthy and savory red fruits on the nose, along with baking spice. Medium-light bodied with lively acidity and moderate tannins on the finish. Halleck 2011 Pinot Noir, “The Union League Club Cuvée,” Sonoma Coast. Sourced from several vineyards. Medium-light ruby color, this displayed bright black cherry and raspberry fruit, herbs, spice, and vanilla/oak. More structured than the previous wine, this could use more time in the cellar for the parts to integrate better. Comments: The Halleck estate vineyard in the Sebastopol Hills was planted in 1993, and the label’s first wines followed about ten years later. Owners Ross and Jennifer Halleck work with several other nearby vineyards as well. The “The Union League Club Cuvée” is a special bottling made for the 150th anniversary of the organization. Ross was on hand to pour the Halleck wines at the tasting. Hartford Court 2010 Chardonnay, Far Coast Vineyard, Sonoma Coast. Fermented in about 40% new French oak. Light yellow color, this featured aromas of apple and pear, earth, lees, and lots of vanilla/oak. Medium-bodied with a creamy mouthfeel and fairly smooth finish. Hartford Court 2009 Chardonnay, Seascape Vineyard, Sonoma Coast. From Spring Mountain Chardonnay clone, fermented in 50% new French oak. Deeper yellow-gold color, with a more citrus fruit profile along with spice, herbs, earth, and sweet oak. Richer mouthfeel but with a lively texture and finish, nice. Hartford Court 2011 Pinot Noir, “Land’s Edge Vineyards,” Sonoma Coast. Sourced from Far Coast Vineyard, aged in about 30% new French oak. Medium-light ruby color, with raspberry and plum aromas, plus notes of flowers, dried herbs, and undertones of spicy oak. Medium-bodied with bright acidity and fine tannins, nice. Hartford Court 2010 Pinot Noir, Far Coast Vineyard, Sonoma Coast. From selected blocks of the vineyard, aged in about 45% new French oak. Slightly darker color, this was more fruit-forward, with riper black cherry and plum, spice, and more noticeable vanilla/oak. Richer mouthfeel and more structured, with a moderately grippy tannic finish. Comments: Hartford Family Winery has been a fixture outside of Forestville for many years, specializing in Chardonnay, Pinot Noir, and old-vine Zinfandel. Far Coast Vineyard is located near Annapolis, at about 1,000-foot elevation, while Seascape is west of Occidental. 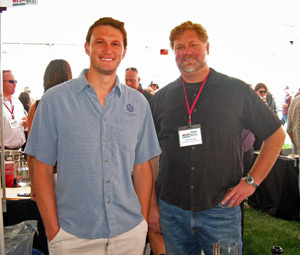 Winemaker Jeff Stewart and assistant winemaker Tiaan Lordan were on hand to pour a strong line-up of their wines. Hirsch 2011 Chardonnay, Estate, Sonoma Coast. Made in 20% new oak. Light yellow-straw color, with white peach, lemonpeel, and herb notes along with undertones of flowers and vanilla/oak. Medium-bodied with a mildly creamy texture and lively acidity, and a chalky mineral sensation on the finish, nice. Hirsch 2010 Pinot Noir, “Reserve,” Estate, Sonoma Coast. Aged in 35% new oak. Medium-light ruby color, with bright raspberry and plum fruit, earth, fresh herbs, baking spices, and a touch of sweet oak. Medium weight on the palate with a lively mouthfeel and moderately grippy tannins – a promising wine that needs more time. Comments: David Hirsch was one of the wine pioneers of the western Sonoma Coast, first planting his vineyard only about three miles from the ocean in 1980. The vineyard, scattered among hillsides and ridgetops above the fog line, is planted mostly to Pinot Noir along with a little Chardonnay. The vineyard is being converted to biodynamic farming. Since 2002, Hirsch has been producing wines under their own label, and Ross Cobb has been making the wines since the 2010 vintage. Joseph Phelps 2011 Chardonnay, Freestone Vineyards, Sonoma Coast. Barrel-fermented in both new and 2-3 year old French oak. Light color, with citrus and pear fruit, earth, lees, and toasty oak on the nose, plus a stony mineral note. Moderately rich mouthfeel balance by juicy acidity and a lively finish. Joseph Phelps 2011 Pinot Noir, Freestone Vineyards, Sonoma Coast. Sourced from 59% Pastorale Vineyard and 41% Quarter Moon Vineyard, about 17% whole-cluster fermentation and 40% new oak. Medium-light color, this displayed bright red fruits, herbs, and vanilla/oak. Medium-light bodied with a fairly lively texture and finish. Joseph Phelps 2010 Pinot Noir, Quarter Moon Vineyard, Sonoma Coast. Mostly 828 clone, plus 115, 113, Pommard, and Calera, from a steeply-sloped vineyard site, about 50% whole-cluster fermentation and 60% new oak. Medium color, showing a darker fruit profile than the previous wine, along with earth and mushroom notes, spice, and a background of sweet oak. Medium weight on the palate and more structured, with moderate but refined tannins on the long finish, nice. Comments: These wines were previously under the separate Freestone Vineyards label, but they’re now labeled as Joseph Phelps. The winery purchased the property – located just outside the town of Freestone – in 1999, and planted Chardonnay and Pinot Noir there. Pastorale and Quarter Moon are parcels of the estate vineyards that are made into separate bottlings. LaRue 2010 Pinot Noir, Sonoma Coast. Sourced entirely from Rice-Spivak Vineyard, aged in 40% new French oak. Fairly light ruby color, featuring earthy and savory aromas plus strawberry and cranberry fruit, spice, and a slight floral note. Medium-light bodied, with lively acidity and fine tannins, nice. LaRue 2011 Pinot Noir, Sonoma Coast. Sourced from Rice-Spivak and Emmaline Ann vineyards, aged in 33% new French oak. Medium-light color, this showed more forward red fruits than the 2010 along with tea leaf, baking spice, and stony mineral components. Bright mouthfeel with more structure than the 2010 and more noticeable tannins on the finish – this should be quite good but still needs time to develop. Comments: LaRue makes exclusively Sonoma Coast Pinot Noir. Owner/winemaker Katy Wilson (also the associate winemaker at Kamen Estate) launched the LaRue label with a Sonoma Coast Pinot from the 2009 vintage. She’s worked at a variety of noted wineries, including Craggy Range in New Zealand, Testarossa, and Flowers. Katy poured her wines at the event, and both the current 2010 Pinot and not-yet-released 2011 showed very well. Lattanzio 2011 Pinot Noir, Umino Vineyard, Sonoma Coast. Medium-light color, with ripe plum and berry aromas, spice, and earth. Medium-bodied with a relatively smooth texture in the mouth and milder tannins on the long finish. Comments: Justin Lattanzio founded his label in 2005. In addition to making his wines, Justin and his wife Hillary own the highly-regarded Santa Rosa custom crush facility Vinify. Umino Vineyard is located in the Sebastopol Hills, and was planted in 1997 with 115, 777, 667 and 459 Pinot clones. Justin was behind the table at the tasting. Lioco 2011 Pinot Noir, Sonoma Coast. Fermented with about 30% whole clusters. Lighter color, displaying savory aromas along with tart cherry fruit, earth, and spice. Medium-light weight on the palate with chalky tannins and a tangy finish. Lioco 2011 Pinot Noir, Hirsch Vineyard, Sonoma Coast. About 40% whole-cluster fermentation, aged in 20% new oak. Medium-light color, with savory and spicy notes upfront, along with bright red fruits, tea leaf, and hints of flowers and forest floor. Vibrant mouthfeel with plenty of structure, and chalky tannins on the long finish, nice. Comments: Established in 2005 by wine importer Matt Licklider and sommelier Kevin O'Connor, Lioco combines their last names. 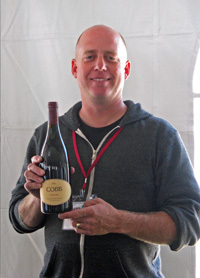 John Raytek of Ceritas took over as the Lioco winemaker in 2011. Both Pinots were very good, with the Hirsch Vineyard bottling being one of my favorites of the day. Littorai 2011 Chardonnay, B.A. Thieriot Vineyard, Sonoma Coast. Light color, this featured pear and stone fruit aromas, spice, and notes of lees, flowers, and vanilla/oak. Medium-bodied with lively acidity and a long, tasty finish, nice. Littorai 2011 Pinot Noir, The Pivot Vineyard, Sonoma Coast. Medium-light ruby color, with lots of spice along with black cherry, earth, and a stony mineral note. Medium weight on the palate with a bright mouthfeel and moderate tannins. Littorai 2011 Pinot Noir, Platt Vineyard, Sonoma Coast. Medium-light color, displaying more minerally aromas along with raspberry, spice, and a touch of sweet oak. Vibrant acidity in the mouth and more structured than the Pivot bottling, with noticeable but refined tannins on the finish, nice. Littorai 2011 Pinot Noir, Hirsch Vineyard, Sonoma Coast. From Pommard, Swan, and 114 clones. Medium-light color, this showed a more savory and herbal character plus a darker fruit profile than the first two Pinots. The biggest and most structured of the three Pinots, with a grippy tannic finish, this should benefit from some time in the cellar. Comments: Littorai Wines was established by Ted and Heidi Lemon in 1993. The Lemons purchased property in 2003 between Sebastopol and Freestone and completed a gravity-flow winery built with straw-bale construction there in 2008. All of the Littorai vineyards are farmed organically or biodynamically – the estate Pivot Vineyard at the winery property is part of an overall biodynamic farm there. Pahlmeyer 2011 Chardonnay, Sonoma Coast. Made in 90% new French oak. Light yellow color, with vanilla/oak, ripe apple, and spice aromas. Fairly rich and creamy on the palate but retaining a bright acidity, this had a long, smooth finish. Pahlmeyer 2011 Pinot Noir, Sonoma Coast. Aged in 67% new French oak. Medium-light ruby color, showing ripe black cherry fruit, spice, and earth on the nose. Medium-bodied with a bold texture and moderate tannins. Comments: Best-known for their Napa Valley wines from Bordeaux grape varieties, Pahlmeyer began planting of their Wayfarer Farm Vineyard near Fort Ross in 2002. In 2012, Bibiana González Rave (formerly winemaker at Lynmar) took over as consulting winemaker for Pahlmeyer’s Sonoma Coast wines. Patz & Hall 2011 Chardonnay, Sonoma Coast. Fruit sourced from several vineyards, including Gap’s Crown. Light yellow color, featuring citrus and apple, spice, and vanilla/oak. Medium-bodied with a fairly creamy texture and lively finish. Patz & Hall 2011 Pinot Noir, Jenkins Ranch, Sonoma Coast. Medium color, with black cherry and plum fruit, earth, lots of spice, and undertones of sweet oak. Moderately rich texture with firm tannins that will need some time to soften. Comments: The partnership of Donald Patz, James Hall, Anne Moses, and Heather Patz began in 1988, and has focused on Chardonnay and Pinot Noir. Their first bottlings from the Sonoma Coast date to around 2000, with the Jenkins Ranch single-vineyard Pinot first appearing in 2005. Noted grower Charlie Chenoweth farms Jenkins Ranch, located near Sebastopol. Peay 2011 Chardonnay, Estate, Sonoma Coast. Light yellow color, this displayed pear, lees, and stony mineral aromas along with a background of sweet oak. Medium-light bodied with a lively texture and a bright, clean finish, nice. Peay 2011 Pinot Noir, Sonoma Coast. Medium-light color, with somewhat shy black cherry fruit, plus floral and herbal notes. Medium-light weight in the mouth with milder tannins. Peay 2011 Pinot Noir, “Scallop Shelf,” Estate, Sonoma Coast. Medium-light ruby color, showing more intense black cherry and raspberry fruit, earth, dried herbs, and a touch of spicy oak. More depth on the palate with moderate tannins, this shows promise but needs a bit more time for the parts to integrate. Peay 2011 Syrah, “La Bruma,” Estate, Sonoma Coast. Medium-dark purple, bright blackberry, herbs, and a savory/smoky note on the nose. Fairly big and structured, with a grippy tannic finish – another youngster that will need time to show its best. Comments: Peay Vineyard is located near the town of Annapolis. The Peay label is run by the husband-and-wife team of Nick Peay, who farms the vineyard, and Vanessa Wong, who makes the wine, and by Nick’s brother Andy, who handles the marketing and sales work. The 51-acre organically-farmed estate vineyard was first planted in 1998, and includes Chardonnay, Pinot Noir, Syrah, Viognier, Marsanne, and Roussanne. Nick was behind the table for the West of West tasting, pouring mostly wines to be released later this year. Ramey 2010 Chardonnay, Sonoma Coast. Sourced from four vineyards, made in about 25% new oak. Very light color, with pear and apple aromas along with spice and sweet oak. Medium-bodied and a moderately rich texture and smooth finish. Ramey 2010 Chardonnay, Platt Vineyard, Sonoma Coast. Aged on the lees for 20 months in 64% new oak. Very light color, this displayed brighter aromatics with more of a citrus profile plus fresh herbs, earth, spice, and well-integrated oak. Medium-light bodied with a vibrant mouthfeel and long, crisp finish, nice. Comments: David Ramey and his wife Carla founded the winery in 1996, and David and Cameron Frey head up the winemaking team there. Platt Vineyard is located above the town of Bodega, with Wente clone Chardonnay vines planted on Goldridge soil. The wines are fermented with native yeasts, and are stirred weekly. Both wines were very good and quite different from one another. Red Car 2011 Chardonnay, Sonoma Coast. Sourced from four vineyards. Very light color, featuring bright citrus fruit, herbs, and flowers on the nose. Medium-light bodied with vibrant acidity and a crisp finish. Red Car 2011 Pinot Noir, Platt Vineyard, Sonoma Coast. From Calera, 777, and 828 clones, with a small percentage of whole-cluster fermentation. Medium-light ruby color, with a savory character along with black cherry and plum fruit, herbs, baking spices, and a hint of sweet oak. Medium weight on the palate with a lively mouthfeel and moderate tannins. Red Car 2010 Syrah, Sonoma Coast. Sourced from three vineyards. Medium purple color, this had aromas of forest floor, black fruits, and a stony mineral note. Medium-bodied with a bright acidity and moderately grippy tannins on the finish. Red Car Estate 2010 Syrah, Estate Vineyard, Fort Ross-Seaview. Medium-dark color, with a savory profile, showing dark berry fruit, black olives, smoke, herbs, earth, and grilled meat on the nose. A bit richer on the palate than the previous wine but with lively acidity, and a chewy tannic finish – very nice now and has the potential to be outstanding with more bottle age. Comments: Red Car was established in 2000 by Carroll Kemp and Mark Estrin, who passed away in 2005. Carroll continues to head up the label and the winemaking. Originally located in Santa Barbara County and focused on fruit from the area, Red Car moved to the Sonoma Coast in the mid-2000’s, planting an estate vineyard on King Ridge, north of Hirsch Vineyard in the Fort Ross-Seaview AVA. The style of Red Car’s wines has evolved considerably along with the change in vineyard locations. Sojourn 2011 Pinot Noir, Sonoma Coast. Sourced from eight vineyards. Medium-light color, this showed herbs and stony mineral notes upfront, with red fruits and earth in support. Medium-light bodied with a lively texture and milder tannins, nice. Sojourn 2011 Pinot Noir, Campbell Ranch, Sonoma Coast. Medium color, showing black cherry and raspberry fruit, earth, spice, and sweet oak aromas. Medium-bodied with a bright mouthfeel and refined tannins. Sojourn 2011 Pinot Noir, Silver Eagle Vineyard, Sonoma Coast. Medium ruby color, with riper fruit aromas, herbs, baking spices and a bigger vanilla/oak component. Richer and more structured on the palate, with a grippier finish. Sojourn 2011 Pinot Noir, Ridgetop Vineyard, Sonoma Coast. Medium color, this featured a more savory profile, with herbs, black cherry, grilled meat, and forest floor on the nose. Moderately rich texture with lively acidity and fine tannins, nice. Comments: Sojourn was formed in 2001 by Craig Haserot and Erich Bradley, and the label specializes in Chardonnay, Pinot Noir, and Cabernet Sauvignon. The three single-vineyard Pinots will be released this fall. Campbell and Ridgetop vineyards are located near Annapolis, while Silver Eagle is in the Occidental area. Tending toward the bolder side for Sonoma Coast Pinots, the Sojourn wines are still very nicely balanced. Zepaltas 2012 Pinot Noir, Suacci Vineyard, Sonoma Coast (barrel sample). From all 115 clone. Medium-light color, with bright cranberry and strawberry fruit, earth, herbs, and a stony mineral note. Medium-light bodied with vibrant acidity and moderate tannins on the clean finish, nice. Zepaltas 2012 Pinot Noir, DeVoto Vineyard, Sonoma Coast (barrel sample). From a vineyard in the on Gold Ridge Road west of Sebastopol, entirely from 828 clone. Slightly darker color, featuring riper berry aromas along with earth, tea leaf, and spice. Bigger structure than the previous wine, with a grippier tannic finish. Zepaltas 2011 Pinot Noir, DeVoto Vineyard, Sonoma Coast. Entirely from 828 clone Pinot. Medium-light color, this had black cherry, spice, and a floral note on the nose, along with a touch of vanilla/oak. Lively and structured on the palate, with moderate tannins. Comments: Ryan Zepaltas (who’s also the assistant winemaker at Siduri) started his own label in 2004, focusing mostly on Chardonnay and Pinot Noir from the Sonoma Coast and Russian River Valley. He typically uses about 30-40% whole-cluster fermentation on his Pinots. Ryan was behind the table at the tasting, and he also poured a couple of older Suacci Vineyard Pinots, which I skipped as I was running short on time.